Jacksonville, FL (March 23, 2018) – Barrel racers chased a $62,000 pot o’ gold at the 13th annual National Barrel Horse Association (NBHA) Shamrock Showdown Super Show held at the Jacksonville Equestrian Center in Jacksonville, Florida March 16-18. Competitors traveled from as far as Canada, Vermont, Tennessee and North Carolina. Racers from nearby South Carolina, Georgia and across Florida are familiar with the Jacksonville Equestrian Center and never miss an opportunity to run for big cash prizes inside the state-of-the-art coliseum. The Jacksonville Equestrian Center was excited to host the group for its fourth consecutive year. A total of 853 entries dashed down the alleyway over the course of the three-day event. In addition to cash prizes riders had an opportunity to win tack and one of 60 wildcards. The wildcards give the first, second and third place finishers in each division a guaranteed slot to compete at the NBHA World Championship Show held each October. The next scheduled event is the Florida Reining Horse Association Spring Show March 23-25. The multi-day reining competition features a full slate of classes from short stirrup and youth to amateur, non-pro, novice, green and open. The second annual Spring Classic Hunter/Jumper show is set to start on April 4 and upcoming events in May include dressage and team roping. Jacksonville, FL (March 28, 2017) – It’s a combination of skill and a little luck that makes a winning barrel run, and barrel racers at the 2017 Shamrock Showdown found some extra Irish luck this month at the Jacksonville Equestrian Center, an 80-acre state-of-the-art equestrian facility in Jacksonville, Florida. Hundreds of competitors and their horses vied for payouts at the annual National Barrel Horse Association show, a highlight of the month for the Jacksonville Equestrian Center. The Jacksonville Equestrian Center held the show in its 3,500-seat 150’ x 300’ indoor arena. In addition to the indoor coliseum, the facility boasts several outdoor arenas, over 400 permanent stalls, ample parking, and RV hook ups. The premier facility was excited to host the annual NBHA show once again, providing riders the opportunity to run for winning titles and their piece of large payouts over a three-day weekend. The Jacksonville Equestrian Center is a top destination for equestrians from across Florida and the country. For Lee-Sims, the convenience of traveling to a nearby venue has always been a huge draw for her and her students. Especially this year, as her 10-year-old homebred Quarter Horse Specta Hayday just recovered from an injury and has returned to the arena only recently. With youth divisions offered at the Shamrock Showdown as well, Lee-Sims’ daughter, Kaitlyn, had a successful weekend competing at the Jacksonville Equestrian Center as well, with top finishes throughout the show. She and her mother plan to continue running at big NBHA shows, and Kaitlyn, who’s been riding since she was two years old, will hit the Junior Rodeo Association shows throughout the rest of the year. With the luck of the Irish on Lee-Sims’ family’s side, they will return to the Jacksonville Equestrian Center next year for another shot at the Shamrock Showdown’s pot of gold. Other events at the Jacksonville Equestrian Center this month have included an all-breed open horse show, community night schooling, dog agility competition, dressage show, and reining show. The upcoming event calendar at the Jacksonville Equestrian Center includes more exciting equestrian and recreational events throughout the spring, and the facility’s staff wishes all future competitors a share of this season’s luck as they compete in the sports they love at the Jacksonville Equestrian Center. The Jacksonville Equestrian Center hosts a spectrum of equestrian events, as well as other sporting, recreational, and community events at its expansive state-of-the-art facility. To learn more about all the facility has to offer, how to host your event there, or to request more information, please visit www.jaxequestriancenter.com. Jacksonville, FL (December 8, 2016) — Horses and riders from as near as the southeast United States and as far as Canada descended on Jacksonville, Florida for the 14th Annual Fiddler’s Turkey Run, held at the end of November at the Jacksonville Equestrian Center. More than 600 entries vied for over $106,000 throughout the three days of barrel racing competition. Many riders are already looking forward to a return trip in 2017 to the facility, which boasts a 3,500-seat 150′ x 300′ indoor arena, several outdoor arenas, and over 400 permanent stalls. Longtime Fiddler’s Turkey Run entries as well as new faces to the competition enjoyed the experience at the Jacksonville Equestrian Center this year. “This was my first time here at the Jacksonville Equestrian Center, and I love it. This is a beautiful facility,” said Kaitlin Chieca of Vero Beach, Florida. “The grounds are wonderful. The people have been fantastic – this is a class act!” Chieca competed two horses at the Fiddler’s Turkey Run – her own “Jacob,” and Heidi Thompson’s “Pinkie.” She was happy with her results, especially as this was only her third show ever on Pinkie. Although for Chieca, the highlight of the weekend wasn’t the scores, but the trip around the barrels. Eleven-year-old Kaitlyn Sims of Elkton, Florida shares Chieca’s passion for barrel racing. Sims was the big winner Sunday in the Fiddler’s Turkey Run Open, turning in a blazing time of 15.08 aboard her Quarter Horse, Specta Goodtime. The pint-sized jockey has been riding since she was two years old and competes in junior rodeos as well as the barrel racing shows. Why spend so much time in the saddle? “I like being able to go fast,” Sims explained. The Jacksonville Equestrian Center was thrilled to once again host the Fiddler’s Turkey Run and all of its talented barrel racers. Sponsors for the Fiddler’s Turkey Run included Equine Medical Center of Ocala, Santa Fe Horse Transport, Wrangler, Formula 1 Noni, Sebelle Dymmek, Triple Crown Feed, Formula 707, 5L Performance Horses, and Seminole Equine Products. The Jacksonville Equestrian Center’s 2016 calendar has several more exciting events planned before the end of the year, including the USDAA Pals & Pals Agility Trials on December 9-11, and Community Night Schooling on December 20. Parking and admission for spectators is free for all events. For more about the Jacksonville Equestrian Center and to find out how to host your event at this multifaceted facility, visit www.jaxequestriancenter.com or call (904)-255-4254. Photo courtesy of Sheri Wurth Images, LLC. Jacksonville, FL (August 24, 2016) – “The perfect definition of the phrase ‘All Boy’” is how Brittany Rowland describes her blond two-year-old son Kasen, whose infectious smile is biggest when he’s outdoors playing in the dirt. “His imagination is out of this world,” says Rowland. “He will sit for hours at a time with his toy cars and trucks and have his own story line going.” The little boy was diagnosed with brain cancer just a few months ago, quickly transforming the Rowland family’s life into a cycle of hospital visits, MRIs, and continuous bad news – but thanks to their local Jacksonville, Florida community, a chance to enjoy an evening of outdoor farm life and an exciting barrel race while raising money for Kasen’s procedures is right around the corner. On Saturday, September 24th, horse trainer Jimbo Albritton will be hosting a barrel race benefit for Kasen Rowland at Albritton’s farm, Flying A Performance Horses in Penney Farms (just outside of Jacksonville), at 3900 Paso Fino Rd., Green Cove Springs. The barrel race is being put on by Dreaming of Three, an organization that uses rodeos and other equine-related events to raise funds for children like Kasen who suffer from tragic diseases. Everyone’s invited to join in the fun of the upcoming barrel race benefit, which in addition to the barrel race will include pony rides, face painting, a bounce house, vendors, food, a silent auction, and a blood donation bus for anyone willing to help Kasen through blood donations. Kasen, for one, is looking forward to the event. “I think Kasen will enjoy getting out of the house, being outside, and experiencing something new and different,” Brittany Rowland says. She and Kasen’s father, Chad Rowland, will also enjoy a night of fun with Kasen and his older siblings, Dillon and Allie. Kasen was diagnosed with a brain tumor in February 2016. When a 12-hour brain surgery was only able to remove 75 percent of the tumor, Kasen had to begin re-learning everything he had so far mastered in his two years of life, down to re-learning how to swallow. He has recently started walking again, but still suffers from weakness in his left arm and hand and paralysis to the left side of his face. Kasen began chemotherapy in March 2016, with high hopes that he would be cured. Unfortunately, the tumor did not respond to the chemo and instead grew larger. Doctors then predicted only a 50 percent chance that Kasen would survive. Kasen is now currently going through treatment with a different kind of chemotherapy, and will have an MRI in September to see if the new treatment is working. “There have been many hospital admissions and setbacks since this nightmare began,” explains Brittany Rowland. “We will use the funds raised at the barrel race benefit to go towards Kasen’s medical expenses, gas for traveling to and from his weekly chemotherapy appointments, and his weekly medication costs. Kasen has a long road ahead. Anyone interested in entering the barrel race to compete for the prize purse can contact Albritton at james.albritton@rocketmail.com or (407) 319-8268. Barrel racing entries are $35.00, and admission for spectators at the event is $5.00 per adult (kids are free!). All businesses are welcome to sponsor the event, or to be a vendor for a fee of $50.00. Advertising and sponsorship packages are available for businesses who would like to sponsor. Anyone interested in sponsoring, vending, donating a silent auction prize, or helping in any other way can contact Albritton for more details. The barrel race will begin at 6:00 pm, so be sure to come by and join in the excitement. To donate to Kasen Rowland and his family, a check can be made out to Dreaming of Three, 5700 Corporate Dr., Suite 455, Pittsburgh, PA, 15237. Dreaming of Three will send the donations to Albritton to be presented at the benefit. Jacksonville, FL (March 24, 2016) – Riders of all nationalities were feeling a bit of Irish luck as they headed to the Jacksonville Equestrian Center this past weekend to vie for an equestrian’s version of a pot of gold at the National Barrel Horse Association (NBHA)’s Shamrock Showdown. The annual competition invited riders to compete in senior and junior barrel racing exhibitions for their share of the prize money. The Jacksonville Equestrian Center, an 80-acre multifaceted facility in Jacksonville, Florida, was excited to once again host the event in its enormous indoor stadium. The fun-filled Shamrock Showdown proved a great opportunity for a family outing as it offered free parking and admission to spectators. With several hundred talented horse and rider pairs competing each day of the competition and rows of barrel racers’ favorite merchandise in the vendor areas, the event was a must for equestrians. Known for its laid-back and yet exciting atmosphere, many spectators and riders alike find themselves celebrating St. Patrick’s Day at the Shamrock Showdown year after year. Ivy Grieb, from Green Coves Springs, Florida, is one of those people. Grieb has been coming to the show for the past seven years. Edie Neal, from Webster, Florida, on the other hand, brought her horse Gizmo to the show for the first time this year, and had an equally positive experience. This was four-year-old Gizmo’s first major show, and the Jacksonville Equestrian Center proved to be a great place to kick off the gelding’s career. With the Shamrock Showdown under their belt, Neal is excited for what lies ahead. The exhibition’s winners included Sabra Moore, Kenny Hodges, Kalie Ruthledge, and Ron Lattimer, among others. All of them clearly had a bit of Irish luck (as well as a lot of skill!) on their side. Today, the Jacksonville Equestrian Center is transforming the barrels and western saddles to dressage rings for the facility’s next event, which will take place on Saturday, March 26. This will be the Northeast Florida Dressage Association (NFDA) Schooling Show, which will include a special Freestyle Challenge. Visit http://www.jaxequestriancenter.com/events/ to find out more about this show and other upcoming events. 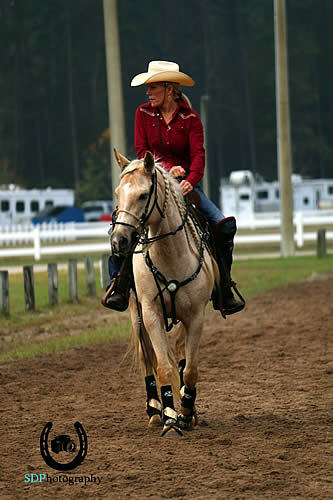 Events at The Jacksonville Equestrian Center range from barrel races to dressage shows to horsemanship clinics and more. Even for non-equestrians, the Jacksonville Equestrian Center makes sure to keep something on the calendar for everyone, with canine shows, concerts, and community events regularly taking place. For more information, visit www.jaxequestriancenter.com or call Penny Gorton at (904) 255-4227. Twist was previously considered a serious risk to anyone who worked with her, now, after her time with Ainsworth she’s running barrels successfully. Jackson, MS – December 1, 2014 – When Jordan Kiker and her mare Twist would show up at barrel racing events no one wanted them there. The mare was reckless, dangerous, and what many considered to be a liability and risk to their safety. Kiker was even offered money not to run the mare, and she was about to throw in the towel and find a new barrel horse. Then a friend made a suggestion that would drastically change things for Kiker and Twist. So with no ideas left on what to do to stop Twist’s dangerous behavior, Kiker turned to renowned horseman Ray Ainsworth. Known as “The Man Horses Talk To™,” Ainsworth does not train horses; he teaches them in a way that makes him one of the world’s most unique horsemen. Ainsworth first began working solely with Twist, before soon working with both Kiker and Twist to help develop what would become an unbelievable partnership. What happened next for Kiker and Twist was priceless. Not only did they surprise the skeptics who did not think that the dangerous Twist that they knew could ever change, Kiker and Twist beat everyone by more than two seconds and set a new arena record – all with no bridle, just a halter and lead rope. Now, in between balancing classes as a chemical engineering major at the University of Mississippi, Kiker teaches riding lessons when she can to pass along the knowledge and approach to horses that Ainsworth instilled in her. Through those lessons, Twist is right there with Kiker, teaching even the youngest students how to ride. Ainsworth travels the world presenting entertaining and informative clinics to horse lovers of all disciplines. Plus, he has a series of comprehensive teaching DVDs. Ainsworth has started as many as 10,000 horses. His stress-free program teaches horses how to behave with a maximum of understanding. He works with all types, breeds of horses – young foals, old mares, abused horses, trailer-shy horses, horses who will not allow their feet and ears to be handled and every horse in between. Ainsworth’s specialty is starting horses the right way and helping address behavioral concerns. Along the way, owners and riders learn horse language themselves and are able to apply this knowledge to their own dealings with these amazing animals. Find out more about Ray Ainsworth at www.rayainsworth.com.